Companies in the food, beverage and dietary supplement industries have lately become prime targets for class action lawsuits, especially in California. From lawsuits challenging “all natural” claims, to class actions alleging products are mislabeled, to suits claiming health claims are unsubstantiated, these industries have seen an onslaught of class action litigation over the last 18 to 24 months. Recent activity would seem to indicate this phenomenon is not changing in the immediate future. How are plaintiff’s class action firms able to find plaintiffs for all these lawsuits in just a couple of days? The secret: plaintiff’s lawyers effectively advertise for plaintiffs using a variety of formats, including Internet search engines, Craigslist and dozens of consumer complaint websites. Having interviewed dozens of plaintiff’s class action lawyers in the course of litigation, we have learned finding a plaintiff willing to lend his or her name to a lawsuit is relatively easy. To anyone familiar with the workings of the class action bar, this onslaught of litigation comes as no surprise. Trial lawyers are an entrepreneurial bunch. Their “product” (so to speak) is the leverage they can manufacture—through bad press, litigation expense and potential legal exposure—against a company. The hope is that, regardless of the merits of the case, most business people will, as rational economic actors, pay some amount in settlement, rather than continue to face the risk, uncertainty and expense of litigation. Most often, this bet by the plaintiff’s lawyers is spot-on. And the continued willingness of many companies to settle has led to even more litigation, as trial lawyers that there is money to be made with relatively little commitment of time and expense. The good news is that, for companies willing to do so, these lawsuits can be successfully defended. Let’s take a look at the recent DMAA cases. The class actions filed to-date against companies selling products with DMAA contain virtually identical allegations, which is not surprising since most of the complaints were filed by the same law firm. In fact, in a rush to be the first to the courthouse, the plaintiff’s lawyers failed to change the language in several of the complaints for those filed against companies that did not receive warning letters, even though the allegations specifically point out the receipt of an FDA warning letter. The complaints rely on three California statutes: the Consumer Legal Remedies Act (CLRA); the Unfair Competition Law (UCL); and the False Advertising Law. Although these statutes have somewhat different requirements, they all prohibit “unlawful” or deceptive advertising claims. Using these laws, the DMAA class actions contain allegations that products containing DMAA are unlawful or deceptive because they fail to disclose the supposed health risks of DMAA, and because DMAA allegedly is not a dietary ingredient eligible for use in a dietary supplement. In many cases, the claims are asserted on behalf of a purported nationwide “class” of consumers who bought the product containing DMAA. No Harm. At the most fundamental level, the DMAA lawsuits do not allege that the plaintiffs were harmed. For those unfamiliar with the recent rise in consumer class action litigation, it may come as a surprise that most class actions are filed by plaintiffs who do not claim to have suffered any physical injury. Rather, the theory is that, by buying a product that was mislabeled, the plaintiff did not receive what he or she thought she was buying and thus suffered economic “harm.” That’s precisely the theory the DMAA plaintiffs are pursuing. They allege that “had they known” that DMAA was “unsafe,” they would not have bought it. The problem for the plaintiffs is that they likely already consumed the product and received whatever benefit the product provided. To show “harm” and a basis to recover money, the plaintiffs must show there was an economic difference between the product as represented and the product they actually received. In many cases, this is a very difficult showing to make, and the DMAA lawsuits filed to-date fall far short of making it. Primary Jurisdiction. Although FDA’s warning letters sparked this flurry of litigation, those same letters could be a blessing in disguise. There is a legal principle called the “primary jurisdiction doctrine,” which essentially holds that courts should not get involved in complex regulatory issues that already are entrusted to a regulatory agency. Whether DMAA is safe and whether it is a dietary ingredient are precisely the types of regulatory issues where courts have declined to wade in and have dismissed under the primary jurisdiction doctrine. FDA’s current focus on these issues enhances the power of this argument. No Basis for Class Certification. The name of the game in these cases is money. And the only way for the plaintiff’s lawyers to get any money is to convince the court that the case should be “certified” as a class action. This has become an increasingly difficult showing to make and requires that plaintiffs come forward with admissible evidence. FDA letters themselves are not evidence—they just represent the agency’s opinion—and hiring experts to test and evaluate various products is not an inexpensive proposition for the plaintiff’s bar. 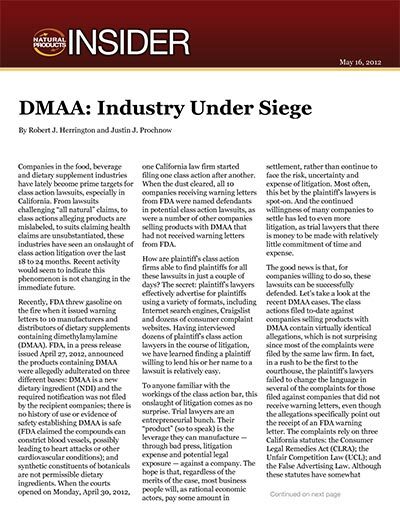 In addition, given that many people already are aware of the issues relating to DMAA, and given that many (a) don’t care, or (b) would take the product even in light of safety risk, it may be very difficult for the plaintiff’s bar to demonstrate that these cases should be certified as class actions. Proof. At the end of the day, the plaintiff’s lawyers must prove their case. In many cases, the plaintiffs are rushing to file their cases so they can be the first to file and be the class representatives, if indeed a class is established from multiple actions. There is no time for independent fact investigation, so these cases are often put together quickly and are based on one media statement or document, like an FDA warning letter. Of course, an FDA warning letter is not proof of a violation, but merely the agency’s opinion that a violation has occurred. The plaintiff will need to prove the allegations in the complaint based on something more than just FDA’s opinion or someone’s comment in the press. It is yet unclear what other facts the plaintiffs may be relying on, if any, besides the FDA warning letters and comments in the media; often, when the facts of the case are actually looked at in detail, the cases unravel due to the lack of any concrete evidence of violations.